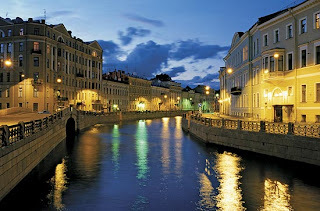 St. Petersburg City, Russia, known as "The Venice of the North". Canals, bridges, and buildings blend with the landscape Rennaisance green. Many traveler oust this city as one of the prettiest in the world. In 1703, this city is the home of the Tsar. Built slowly with neat landscape. Constructed magnificent bridges over the River Neva. First, the city was known as Petrograd. Then changed its name to Leningrad. This city was the capital of Russia. After moving to the Russian capital Moscow, the city did not come behind. The landscape is still beautiful, with many bridges across the canal, canals. A cold wind from the Baltic Sea did not freeze the city of romance. Rennaisance-style buildings still dominate, to witness the glorious history of the Russian nation. The only thing that changed was his name, St. Petersburg. This historic city then was asked to UNESCO as a World Heritage Site. Russia's second largest city is often called as a city of magic, because its existence is to hypnotize the tourists. Tourist destinations are scattered in many places, including some small islands such as Vasilievsky and Admiralteisky. The Hermitage Museum is the belle of St Petersburg. Located in downtown, the museum is housed in a magnificent palace. It was home to three million works of art by famous artists such as Rembrandt, Da Vinci, Michaelangelo as well. Identical with the Russian army, therefore, you must visit the Museum of Artillery, Combat Engineers and Signal Troops occupying a fortress. There is a large collection of weapons from the past to the present, including during World War II and the Cold War. Almost all the buildings in St Petersburg has a Rennaisance style architectural design. However, one of the buildings that you must visit is the Church of the Saviour. This is a medieval-style cathedral that was built right where the killing of Tsar Alexander II in 1881 ago. Even so, the interior is very beautiful. In the building of 6,000 square meters is filled with colorful mosaics, which makes it very beautiful when it is enshrined in the camera. After visiting all three sites, try to follow the Canal Boat Tour which is along the River Neva. The most beautiful when you do it in the spring like now! Do not forget to stop by Vasilievsky Island, which contains dozens of tourist destinations. One of the favorite destinations on the island of Vasilievsky is Andreyevsky Cathedral. Built in 1780 ago, this beautiful cathedral surrounded by three towers taper. If viewed from a distance, looked like a fairy tale castles! In addition, there is also one of the greatest museums in the world of the Naval Museum. It contains traces the history of the Russian army, including the legacy of World War II. Been to St Petersburg is not complete if not watched the Russian show, opera and ballet. One of the places you see this show is at the Mariinsky Theater and the St. Petersburg Opera. For souvenir shopping, head to the Souvenir Market is located near the Church of the Saviour. This traditional market sells a variety of souvenirs and knick-knacks that Russia, including the famous doll Matrioska. In this market there are also famous crepe seller. Do not forget to taste the typical Russian crepes with mushroom stuffing, caramel, berries, or caviar. To get a wonderful evening atmosphere, there are two options you can do. First, look at the beauty of The Bridges on the Neva. At night, the bridge is decorated with dim lights that make it very beautiful to the eye. Twice a day, the bridge is open for ships to pass underneath. You can enjoy this scenery from the banks of the river, while lying on the grass and blown the night breeze. The second option, you can visit the Saint Isaac's Cathedral. This is the third tallest domed cathedral in the world. To achieve the highest observation deck in the tower, you have to climb 400 steps. However, the struggle will be worth it. 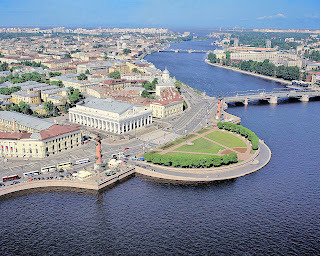 Beautiful portrait of City of St. Petersburg lies in front of the eye. In this moment, you may wish the time would cease to be able to enjoy all the beauty of St Petersburg.